Paperweights, Mousepads, Coasters, USB Accessories, Calculators, Journals, Pens and more! Spa Kits, Robes, Watches, Crystal, Journals, Caps, Jackets, Manicrure sets and more. Our stunning 9" Milford Crystal Vase is sure to make a statement. 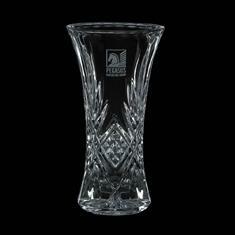 This beautiful vase is made of the finest 24% Lead crystal with a diamond cut to refract light. It comes packed in a presentation gift box. The perfect Anniversary, Retirement or Thank you gift! Imprint Area: 1-1/2" x 1-1/2"